Rumor has it that one of the world’s largest mobile cranes has been sitting on the construction site for Intel’s new 300mm Fab in Ocotillo (Chandler, Arizona). The work site is littered with large and small cranes, and although this one doesn’t tower over the rest, it is definitely one massive crane. From my understanding, the crane is owned by the Dutch company Mammoet and will be used to ‘raise the roof’ and lift the steel trusses that will act as a home for the Fab’s air handling system. Click on the ‘more’ link below to see an actual pic (I’ve pointed out a van for reference, and you can see the steel trusses in the foreground). Background: The Company who owns the crane (Mammoet) is based out of Holland. The crane operator is from Holland and is the only person who operates the crane; in essence he goes wherever the crane goes. In addition, one engineer is on site at all times. Shipping Stats: It takes 85 trucks loads and 4 rail cars to transport the crane to a site. The rail cars are for the crane mats and tracks — which weigh 100 tons each — and cab assembly components. The dimensions of the crane are 50′ W x 50′ L and a track height 8′. 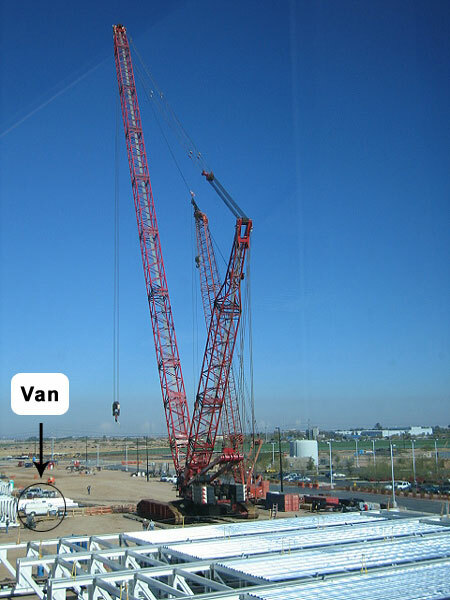 Where it came from: The crane was shipped from Venezuela via Houston to the Intel Ocotillo site. It is slated to go to Canada next. Boom length (single): 370 feet. The boom itself weighs 160 tons. Crane lift weight capacity: 1200 hundred Metric tons. Weight of dual trusses as built: 70 tons each (26 sets and 8 single trusses were erected). Weight of the dead man rigging equipment configuration which actually connects to the load: 25 tons along with another 5 tons of misc. Total load is 100 tons for each truss lift. Amount of counter weight for the longest lifts: 600 tons (200 tons on the backside of the crane and 400 tons off the back boom stack which lifted approx 2 ft off the ground during heaviest lifts). WOW! That is a huge crane. I might just have to drive down and take a picture of that this weekend. Amazing stuff. What a coincidence. I stumbled across that same forum when I was looking for more info on the crane. I am looking for photo’s of the transport of the Gottwald RG-912 with railcars. This is the crane on the photo. I am fortunate to be able to work with these cranes everyday, as I am an operator in training. Mammoet is one of the world’s largest heavy lift companies and owns many of the world’s largest cranes. They have cranes with lift capacities of over 2500 metric tonnes and can reach heights of over 900 feet. If you are interested in some of these cranes, take a look at this site: http://www.kranen.tk. All of Mammoet’s cranes aswell as many of the massive lifts they have performed can be found there. If you have any other questions, please feel free to ask me! Isn’t the RG 912 a beautiful piece of engineering. I am a big Gottwald fan. Gottwald in German means God Forest. Unfortunately, Gottwald doesn’t even build crawler lattice boom cranes anymore. The 912 is one of the last. I didn’t even realize that Mammoet did any lifts here in the U.S. Mammoet means ‘mammoth’ in Dutch. Mammoet has a large livery of beautiful cranes including some really nice DeMags. They also have some beautiful ‘ringers’ and if you like big cranes you really should go visit Mammoets site at: http://www.mammoet.com/ and view ‘equipment’. Their Huisman-Itrec PTC, is likely the biggest land based crane in the world. It’s a ringer. When is the crane leaving the site? Can anyone take photo’s of the transport by car or rail? Looking for photo’s of cranes transported by rail in the USA or Canada!! Jan, unfortunately the crane left the Arizona site way back in April so it’s long gone or else I would’ve tried to get more information for you. If you can get some information that would help me. Wait till you see the new Manitowoc 31000! It is said to have a lift of 2300 metric tons!! I work for Manitowoc Crane in Port Washington and wait, it’s in production now. I’m the builder ( welder/fabricator ) of the crawlers. That cranes cute! Try lookimg up a Transi-lift, thats a crane! That’s the biggest crane I have ever heard of. The boom weighs 160 tons? 85 trucks to move it around? I wonder how much it costs to hire for a day? Thanks for sharing. I have been working in DESCON Company Pakistan, since 1990 in charge of the heavy lift. Our company recently bought a GOTTWALD AK-912-1200 metric tonnes. I would like to ask what is the biggest crawler or truck crane in the world? The largest capacity crawler crane in the world is the Terex Demag CC8800-1 Twin with a lifting capacity of 3200 metric tonnes. The largest capacity crawler crane in the world is Terex Demag CC 8800-1 TWIN. The first machine was built by Demag in collaboration with Al Jaber Heavy lift and Al Jaber is the owner of the first machine. Right now this machine is working in Hamriyah, in arab emirates. Working on the leg extension project for the rig Noble Roger Lewis. Configured for the first time int he world with 93 m main boom + 99 m luffing jib. It can go upto a total of 117 m main boom & 117 m luffing jib. total 235 m.
I am currently loading the Manitowoc 31000 onto a ship it consists of 90 pcs with each piece weighting 40,000 lbs or more. Its going to be a huge crane, Id love to se it all put together. Sany has the largerst cralwer crane in world. 3,600 tons. The Manitowoc 31000 is still on the test pad and has not ever left except to be broken down and NDT tested! The crane is now rated at 2,535 tons.